Detectives are searching for a local man in connection with a knife attack in Eastbourne. 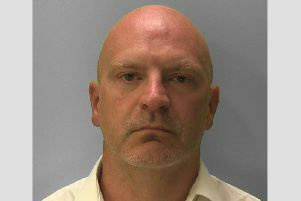 Sussex Police says officers would like to interview 46-year old Paul Edge, of Downland Close, after an incident which took place on July 11. On the night of the World Cup semi-final between England and Croatia, police say a 26-year-old local man was attacked, punched and kicked and stabbed in the leg in Sorrel Drive at about 10.30pm. Mr Edge is described by police as white, 5ft 8ins and of stocky build. Detective Constable Elliott Lander said, “We believe Edge left town after the incident, but may now be in the area again. “If you know where he is, or if you have any other information, please contact us at once on 101 or online quoting serial 1516 of 11/07. Although the incident happened on the night of the World Cup match, police say there is currently no evidence to directly connect it to the match. According to Sussex Police, two other Eastbourne men have been arrested in connection with the incident and after being interviewed have been released under investigation. They are a 20-year-old man arrested on suspicion of violent disorder, and a 48-year-old man arrested on suspicion of causing grievous bodily harm with intent.